Program your radio conveniently at your computer, enter data for each memory, sort them and manage them in any way. 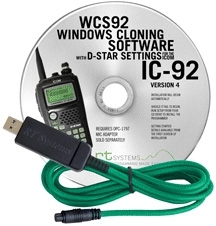 If you have an Icom D-Star radio, all relevant D-Star settings can be done with this software as well. The memories can be stored on the computer as a file, printed and copied to other radios (cloning function). You can have several files open at the same time, making copying and merging data very easy. The radio is connected with the supplied cable either to a USB port of your computer. The programming kits are suitable for XP, Vista and Windows 7 (32 and 64 bit). With 'wine' they are also useable under Linux. 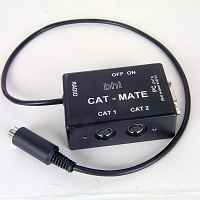 The supplied cable can be used independently from the supplied software also for CAT control of the radio from a computer. The cable has the same function as the 'CT-62' by Yaesu or the 'CT-17' by Icom. The interface cables with USB are suitable for modern notebooks which don't have traditional serial interfaces. 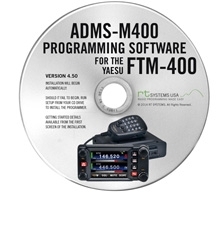 For ADMS-M400/ADMS-FT1D: Transfer data to the radio using a micro SD card. No need to move the radio from the car. Easily carry the program to the radio. Helpful tool for a.m. products: FindComPort - an Utility to find virtual COM ports which haven't been recognized by the CAT software. The software is suitable for all current WIndows version from XP to Win7, 32 and 64 bit. 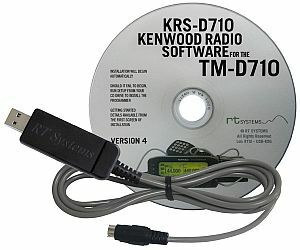 The reuired USB programming cable is included (except for the TH-D72, where the cable is supplied with the radio). The cables are compatible to the Kenwood cables and can be used for all functions available on that radio. The USB-63 is a cable with a serial connector (DB-9) for various radios, and an USB connector for the computer. This allows you to connect many radios with calssic serial CAT interface a computer with USB only. Length approx. 180cm, incl. CD-ROM with drivers for Windows 2000, XP, Vista, 7 (32 or 64 Bit). The CT-62U ist a cable with plug for the CAT interface on various Yaesu radios, and a USB plug for the computer. This allows you to connect various radios with a CAT interface port to a computer with USB only. Length approx. 180cm, incl. CD-ROM with drivers for Windows 2000, XP, Vista, 7 (32 or 64 Bit). The USB-RTS01 is a cable with a connector for the serial (Remote) connector on most Icom radios, and an USB connector for the computer. 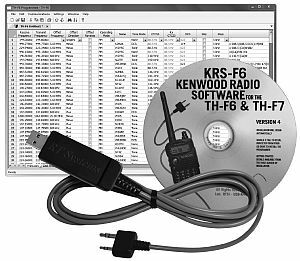 This allows you to connect practically all Icom radios with CI_V interface to your USB equipped computer. Length approx. 180cm, incl. CD-ROM with drivers for Windows 2000, XP, Vista, 7 (32 or 64 Bit). IC-78, IC-271, IC-275, IC-375, IC-471, IC-475, IC-575, IC-703, IC-706, IC-707, IC-718, IC-725, IC-726, IC-728, IC-729, IC-735, IC-736, IC-737, IC-738, IC-746, IC-746Pro, IC-751A, IC-756, IC-756Pro1/2/3, IC-761, IC-765, IC-775DSP, IC-781, IC-820, IC-821, IC-910, IC-970, IC-1271, IC-1275, IC-7000, IC-7200, IC-7400, IC-7410, IC-7600, IC-7700, IC-7800, IC-R3, IC-R10, IC-R20, IC-R71, IC-R72, IC-R75, IC-R7000, IC-R7100, IC-R8500, IC-R9000, IC-R9500, IC-RX7, IC-X3. 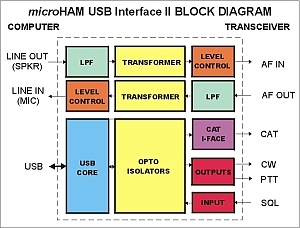 The new USB-II interface by microHAM is an enhancement to the popular USB-interface (see above). This interface offers the usual level converters for nearly all CAT interfaces, electrically isolated lines for PTT and CW keying, an input for a squelch signal and electrically isolated audio interfaces. This makes this device ideally suited for all users who wants to run digital modes from the soundcard. The microHAM USB-II device works with all comouters with USB interface, drivers are available for Windows 98SE/ME/2000/XP/Win7/Win8, Apple Macintosh OS8/OS9/OS-X and Linux. MS-DOS is not supported.